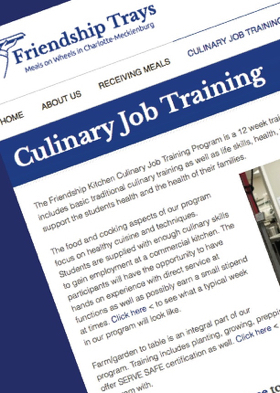 Lucy Bush Carter, executive director of Friendship Trays, made this presentation Tuesday about the launch Wednesday of a new culinary job training program. Friendship Trays, launched in 1976, is the primary meals-on-wheels program in Charlotte-Mecklenburg. “About 20 years ago, the director of Friendship Trays and some other people in the hunger community created a program called the Charlotte Community Kitchen. It was a job training program that took people who were unemployed, underemployed, had barriers to employment, and they basically apprenticed in our kitchen, working alongside our staff to learn culinary skills so they could go out into the community and make a living wage. “We started in 1997 I think, with one or two students. That Community Kitchen program morphed into the Community Culinary School of Charlotte. They partnered with us until this summer, and they have moved on. They’ve built a new facility and have moved out to Matthews to continue to pursue their program. “We feel like we did a really good job launching a culinary training program. We feel like there is a demand in this community for good culinary job training skills. They would ordinarily get over a hundred applicants every time they did their classes, and take 20. So that tells me there is a demand, and so we’re going to re-launch another program. “It will be focused on the Friendship Kitchen, which is still our kitchen on Distribution Street that produces between 700 and 800 meals every day. Some of those go to home-delivered people, and some of them go to adult and child day care centers. “We are committed to serving healthy food to people. We have a network of 70 gardens. We’re growing fresh food, including an urban farm at Garinger High School, where we’re growing fresh foods that we incorporate into the meals as we can. “And we’re going to use that food as a tool to train people. It’s going to be a wholeness and wellness program. It will not be just be about culinary skills, but it will also be about personal wellness and personal health and eating well and personal skills, interviewing skills, all kinds of life skills. “So that launches tomorrow. We have one student and we’re very excited about that. “The reason I wanted to convey that to you is that I believe you may be in touch with people and programs that are looking for an opportunity for their clients to start over, or get retooled and be able to become again productive members of society. “So it’s a great way to do all of that and to support the meals-on-wheels program. We have a beautiful kitchen. I think it’s one of the cleanest kitchens in Charlotte because we’ve always got people learning that the culinary business is not glamorous like it is on the Food Network; it’s hard work. And it takes a lot to keep a good healthy kitchen serving good healthy food. “So their certification will be that they will have the opportunity to get ServSafe training and ServSafe certification, and then empowered to make a living wage. “We are partnering with Covenant Presbyterian Church. Our former kitchen manager is the kitchen manager at Covernant, and so while they will get kitchen skills and food service skills in our kitchen, at Covenant they will get direct service and the opportunity to work on banquets and Wednesday night suppers and get the direct serving of the customer experience as a part of their training. In answer to questions, Carter said students would not pay fees. “The way they pay their tuition is they work alongside our staff to help them in a very instructional environment to get the meals ready to go out to our recipients….